of the TSR SYSTEM and the subsequent instant search and presentation of recorded information. It can be effectively used if necessary in the shortest possible time for organizing multi-channel recording of radio and telephone conversations, for example, in the area of natural disaster and emergency situations through a regular laptop and external USB sound cards. 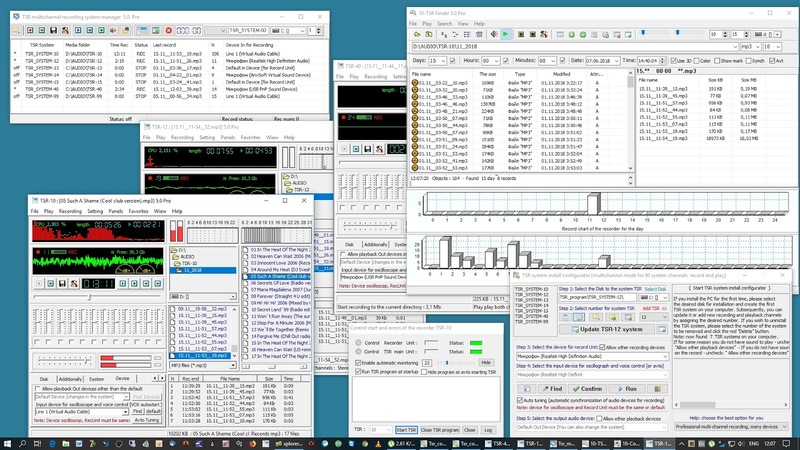 Also great for control rooms and home use on a regular computer. It can be recording any audio source: from radio receivers, from radio stations of radio amateurs, microphones, streaming audio (using a virtual audio cable and setting up a Windows mixer), as well as from a home phone line (through an adapter or a transition transformer) or just to digitize music from analogue ones MP3 and OGG sources. 1. Record in MP3 or OGG formats [compression on the fly], playback of main formats. 2. Convenient manager of recorded files, simultaneous recording and playback. 3. Start recording manually or using voice control [VOX system], channel visual control oscilloscope. 4. Flexible setting of the pulse filter for correct operation of the voice control system in the presence of strong interference. 5. Automatic deletion of old entries above the specified number or at 90% disk capacity. 6. 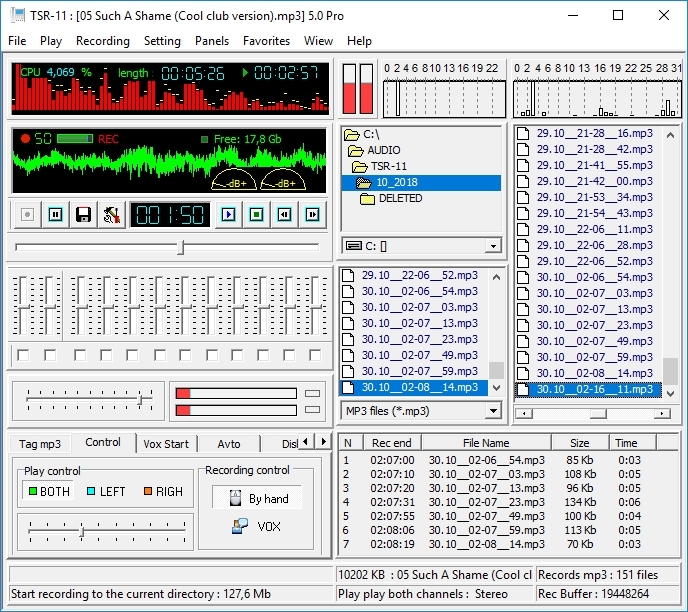 Automatic time-slicing of files when recording [if using voice start, for example, when digitizing analog audio]. 7. 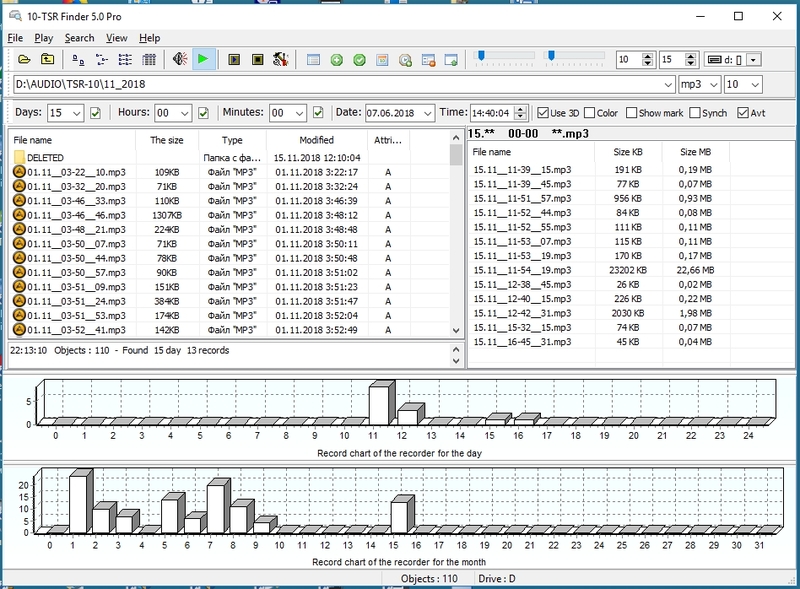 Availability of a special utility for conveniently searching records by date and time, building activity graphs [on the number of records, for example dispatch load] in two-dimensional and three-dimensional form. 8. During playback, a ten-band equalizer and spectrum analyzer of the audio signal are available, as well as the ability to quickly switch between stereo channels [for example, if one audio source was recorded on the left channel and the other on the right one, it's convenient to use if there is only one sound card and two recordable phones , or one channel telephone line, and the other radio, etc. ]. 2. Manager of TSR systems allowing you to quickly activate, monitor, control and disable the necessary channels. 3. A special utility that controls possible program crashes, allowing you to immediately restore the functionality of the software package, as well as many other useful features; convenient interface for quick mastering of the program by users of medium qualification, maximum optimization by default for a quick start. The program is distributed as shareware, but has no significant limitations for normal home use - the time of continuous operation is 40 minutes, after which you just need to restart the program. Ideal for everyday use when you need to record the audio signal of interest from the telephone line, professional and amateur radio systems, Internet stream, microphone and save the audio archive in the corresponding database of audio recordings with the ability to quickly find the recording of interest at any time. Registration is relevant for professional use - $ 10 per PC.